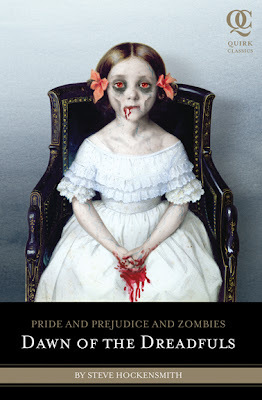 Pride and Prejudice and Zombies came out to critical acclaim back in 2009. It mixed up Jane Austen's classic novel and set it against the back drop of zombie apocalypse.Its success led to two more books in the series. A sequel (Dreadfully Ever After), and a prequel; Dawn of the Dreadfuls. I thought I may as well start with the prequel. Set four years before Pride and Prejudice and Zombies the book opens with England in relative bliss. Attending a funeral of a local man the people of a small English village are shocked to see the deceased return to life. Mr Bennet recognises the event as the return of the unmentionables (what people of polite society call the zombies). Many years in the past the unmentionables rose up but were defeated. Mr Bennet realises he must train up his beloved daughters in the way of the fist to battle the new threat. Shunned by their equals the daughters nonetheless become warriors. As Elizabeth Bennet realises her fate she comes under the attention of two very different men vying for her affection; Master Hawksworth her powerful sensai, and Dr Keckilpenny who would rather battle the undead menace using his intellect. Having read the original I knew straight away that Hawksworth and Keckilpenny would more than likely come to tragic end (as they are not in that one) , also that no harm would befall the principal characters. Being an original piece of work rather than an adaptation of someone elses work Hockensmith was able to bring far more humour and excitement to his prequel. The book is consistently funny, much of it comes from the language which is written in Austen's style. These are people of high society dealing with zombies, and they act accordingly. A lot of new characters are introduced, a highlight being Captain Cannon; the leader of the battalion of soldiers brought to the peoples aid. He had fought in the previous zombie war and had lost all his limbs then, so he is carried around in a wheelbarrow by two soldiers who he calls 'his limbs' and do everything he would do if he was able, such as when he wants to think he gets his limbs to pace his wheelbarrow back and forth. Not having to fit into the template of a pre-existing story means that much more exciting events are able to happen, the whole last fifth of the book is a siege and is very exciting bringing lots of drama and action, from that point onward I just could not put the book down. Plot twist after plot twist happens, I really was not expecting any of them, tying together loose threads from earlier events to fantastic effect. Like the other books in the series there are drawings every now and again from key moments in the book, This time around I think all of them actually cover zombie scenes, they fit well into the style of the book. It will be interesting to see how natural a fit this prologue tale is with the main book which I shall be reading next. Dawn of the Dreadfuls is a wonderful zombie novel, funny, action packed, well written, and a warm nod to the books of old. It has to be said better than Pride and Prejudice and Zombies.